Feline adult teeth usually begin appearing at 3 to 4 months. Kittens grow up so quickly. The little ones seem to lose their baby teeth as rapidly as they get them. Your furry cutie's deciduous teeth -- her first teeth -- probably will begin falling out when the kitten is 12 weeks old. That's about the time the adult set starts emerging. Kittens have 26 deciduous teeth. Cats don't come out of the womb fully equipped with chompers. According to the Humane Society Veterinary Medical Association, their first incisors start to pop up when they're 2 and 4 weeks old. 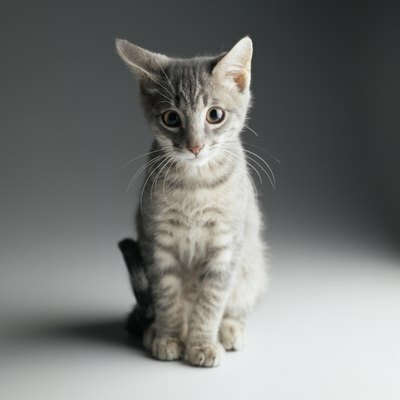 The canine and molar teeth typically follow shortly, with the entire set completed when a kitten is about 2 months old, or of early weaning age. Kittens do indeed lose all of their 26 baby teeth, just like human children lose their baby teeth, the ASPCA indicates. A kitten generally starts losing teeth at 3 months, around the time her adult incisors begin to slowly grow in. The incisors are followed by adult molar, premolar and canine teeth. By the time a kitten hits about 6 months old, she usually has all 30 of her adult teeth. While a kitten is amid the process of losing her teeth, her gums might be a bit sore and swollen. Because of this, you could notice a little bit of crying, and perhaps some occasional refusal to eat. Excessive drooling, chewing and halitosis are also possible. Teething is not the most comfortable or pleasant process. So don't be surprised if your normally sweet, calm and mild-mannered kitten is suddenly unfriendly and in a bad mood. The poor thing could be in pain. If you want to see how many teeth your kitty might have lost, count 12 on the bottom and 14 on the top. That makes 26 "milk teeth" total. As an adult, your fluff ball will have 30 teeth, essentially 14 below and 16 above. Knowing how many teeth your kitten is supposed to have should make this tracking a lot easier on you. What Happens to a Kitten's Teeth When Teething?